The MBC Wednesday and Thursday drama “The Moon that Embraces the Sun” (The Sun and the Moon) directed by Kim Do Hoon is leading the upsurge of saguek historical drama. 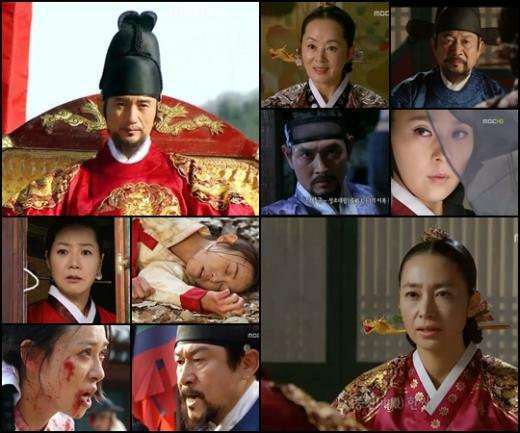 The Moon the Embraces the Sun that debuted on January 4th, 2012 achieved ratings of close to 20% for its first two episodes, ranked number one among all dramas of same time slot. In particular due to the wind of “popular historical drama” since 2011, The Moon that Embraces the Sun garnered the the ratings of more than 18%, and rose again in the second episode. The ratings are almost double of the ratings of dramas aired at the same time, landing a landslide victory. Last year, the KBS drama that becomes hot discussion is romance historical drama, the Korean version of Romeo and Juliet. Besides, SBS’s Deep Rooted Tree (A Tree with Deep Roots) also proven the popularity of historical drama. Since the beginning of 2012 new year, The Moon that Embraces the Sun is triggering the upsurge of historical drama again. The Moon that Embraces the Sun is adapted from the novel of the same name written by the author of “Sungkyunkwan Scandal.” In addition, the drama is a collaboration between the playwright of “Capital Scandal” and “Wonderful Life,” Jin Soo Wan and director of “Royal Family” and “Spotlight,” Kim Do Hoon. Before the broadcast, the production team was meeting with the original author of the best-selling novel, receiving a lot of attention. The Royal Family of director Kim Do Hoon centers around the infighting between chaebols and the human nature, receiving a lot of praises, and the youth trouble and romance that happens during the process, which gave audience high expectations. The thing that most important than anything else is child actors. During the initial broadcast of The Moon that Embraces the Sun, the freshness of child actors and popular actor Kim Soo Hyun who challenges historical drama for the first time become highlights for the drama. The performance of Han Ga In who returns to the small screen after 3 years also receiving lots of expectations. Comparing with her previous films, the new role is a 180 degree transformation. Both Han Ga In and Kim Soo Hyun are appearing in historical drama for the first time, inciting curiosity. Although Jung Il Woo has appearing in historical drama previously, but he is full of worry for the acting of his role. The characteristic of “The Princess’ Man,” “Deep Rooted Tree” and “The Moon that Embraces the Sun” is that they all based on history from “Annals of the Joseon Dynasty,” and then break away from the history, adding with imagination to become a sageuk. The freely dramatic expression and the gorgeous scenes that do not existing in modern drama are also the reason sageuk firmly grasped the attention of viewers.